Illustration of HIV virus matrix protein p17gag (MA) shell. The above image is 400 pixels across, the original measures 2200 pixels across. 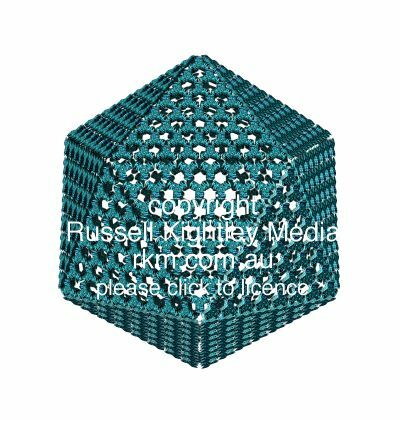 Human Immunodeficiency Virus (HIV or AIDS virus): this illustration shows trimers of HIV matrix proteins arranged to form a cage like structure with characteristic hexagonal rings clearly visible. The matrix lies immediately beneath the viral envelope (plasma membrane derived from the host cell) and its architecture determines the overall appearance of the virus. Inside the matrix shell lies the core (not shown) which contains the genetic information (genome) of the virus. The matrix protein arrangement is based on the model for the MA shell published in: Journal of Molecular Biology (2000) 298, 841-857, Molecular Modelling Study of HIV p17gag (MA) Protein Shell Utilising Data from Electron Microscopy and X-ray Crystallography. M. J. Forster, B. Mulloy and M. V. Nermut.